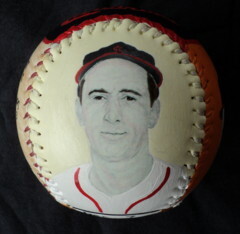 This Great American 1946 World Series Baseball features four of my original paintings. 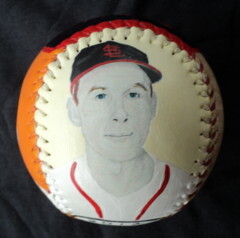 Side one is my close up painting of Harry Walker who batted .412 in the series. Click here for a closer look. 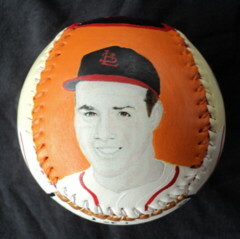 Side two is my painting of Joe Garagiola who hit .316. Click here for a closer look. Side three has my painting of Harry Brecheen who won 3 games. Click here for a closer look. 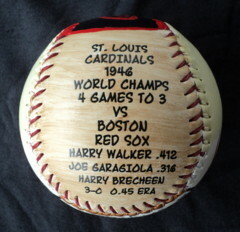 Side four lists some 1946 World Series stats. 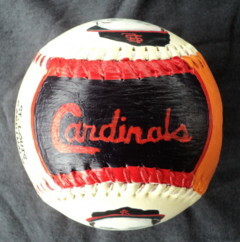 Side five, which is the top of the baseball, has "Cardinals" hand painted in team colors. Shipping is FREE within the Continental United States. 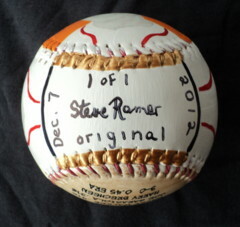 Please add $10.00 for International Shipping when ordering (Includes Hawaii and Alaska).